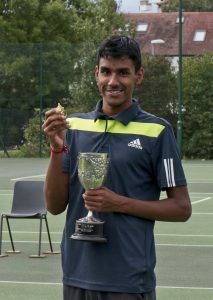 We are very proud of the Club’s teams playing in the Surrey League who had an outstanding summer of tennis. Both of our Ladies teams, plus the Mens’ Second and Third teams, won their respective divisions. Congratulations to all who participated, and thank you to the Captains for organising the matches. Best of luck for the forthcoming Winter League. There will also be a special Christmas-themed American tournament on Saturday 29th December. Look out for more details nearer the time. It was lovely to see so many Members and guests come and watch our annual Finals Day. All the players enjoyed the support of their friends and family, and our team of volunteers ensured everyone was sustained with a delicious barbecue. 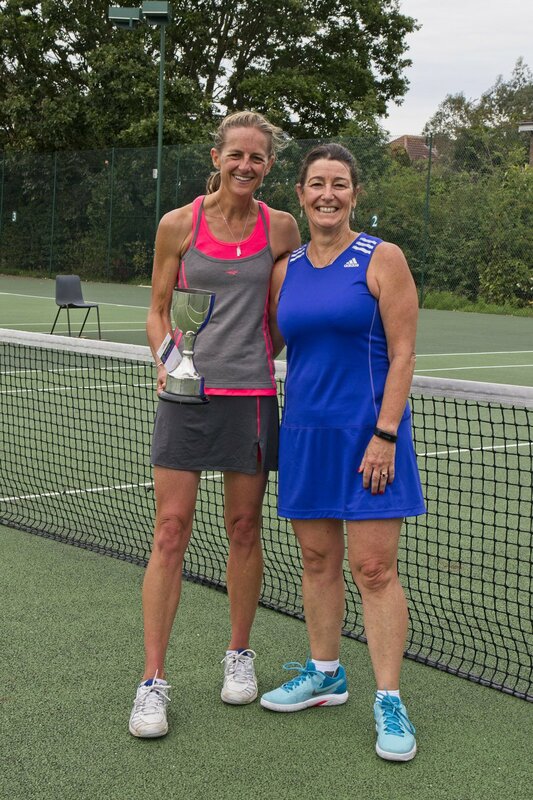 The first event was the Ladies Singles, with Louise winning 6-2 6-1 against Lizanne. Thanks to our Junior Members Anna and Ella who were ball girls for this match. Next up was an incredibly close fought match between Arunan and Neville. Neville took the first set 6-4, but then Arunan struck back 6-1 in the second to send it to a match tie-break. This was very even with Arunan winning by just two points, 10-8. The Ladies Doubles (picture below) saw Lizanne and Louise face off across the net for the second time in the day. 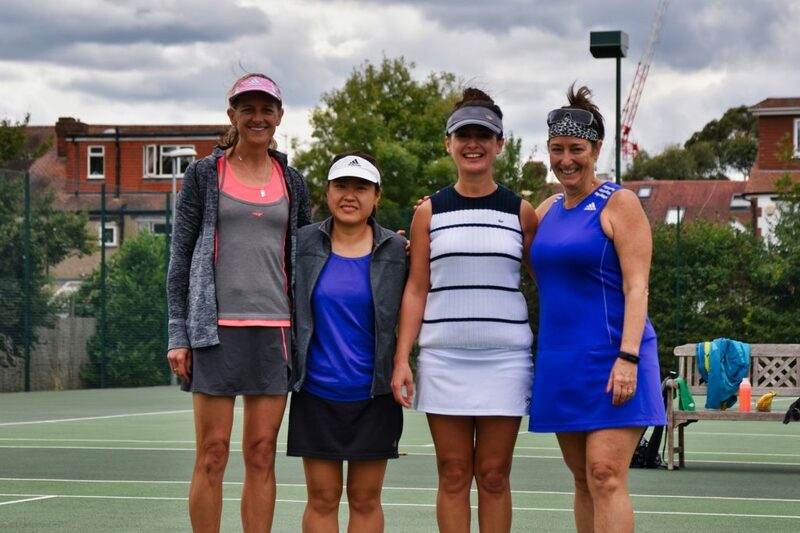 This time Lizanne and Handan were the 6-2 6-1 winners over Louise and her partner, Jo. 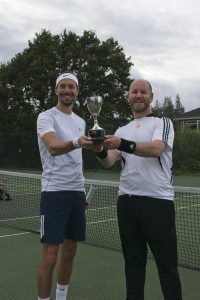 James and Warren were crowned the Mens Doubles champions while in the Mixed Doubles Lukasz and Steph beat Nathan and Martine 6-4 7-5 in another closely fought contest. Congratulations to all! And don't forget to sign up for the Winter Doubles Tournaments in the club house for your chance at glory! Many of you told us you really enjoyed the coach-led social session José hosted earlier in the summer. We are therefore pleased to announce that it will be returning on Saturday 15th September at 1:30pm, and thereafter the first Saturday of every month. The joint weekend social sessions with Wilton LTC will also be continuing into September, 3-6pm. Currently confirmed dates at 15th and 16th September. While the weather may be already turning Autumnal, the tennis continues at RPRLTC! From 1st September we will be offering a special discounted price on membership for the remainder of the club year (31st March). 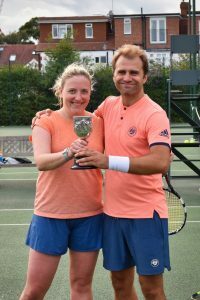 Join us in September and you can take part in our Mixed Doubles Winter Handicap, and Doubles Plate tournaments, plus all the usual regular social sessions, coach-led social and our annual Christmas American tournament! This coming August Bank Holiday Monday we will again be running a fun and social tournament from 2–6pm. This is open to players of all standards from both RPRLTC and Wilton LTC. The format will be the Wilton-take on an "American" tournament—a fun way to play doubles with a variety of different partners and opponents over the course of the afternoon. There will also be a Charity Bake Sale and Raffle organised by one of our student members. Bring some cash for a donation to receive lots of tasty cake to keep you energised on court, and the chance to win some great prizes. Please arrive at 1:30pm to enable the draw to be made in time for a 2pm start. It can be difficult to add late-comers once the draw is made. While we will try to accommodate everyone on the day, spaces are limited so please do sign up in the club house to secure your place. After some close fought matches throughout the summer, the Club Championships culminates with Finals Day. Come and watch some great tennis, support your friends and relax with some drinks (BYO) and food. Social tennis sets will also be played on courts 4&5. Some of our 2017 champions. The first match, the Ladies Singles Final, will start at 10:30am, followed by Men's Singles, then the Mens Doubles, Ladies' Doubles, and concluding with the Mixed Doubles. 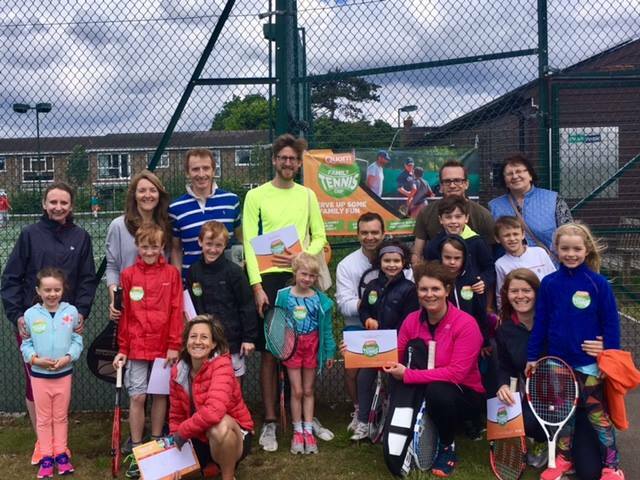 Know any 4-7 year olds who want a free racket, balls, personalised t-shirt, and a super fun 6-week introduction to tennis for £25? Sign them up and we promise them a great time! Now the World Cup and Wimbledon have concluded, there's no longer any exciting sport to tempt to you stay at home with the telly instead of getting out and on court for social tennis! As an added bonus, Saturday 28th July will also be our Summer Social Barbecue for all members and their guests. Barbecue items will be provided, please bring along a side, salad or cake if you are able. As usual, it is BYO drinks.  Social tennis will start at 2pm and the barbecue will run all afternoon. From 28th July and all through August, we will be running longer weekend social sessions with players from nearby Wilton LTC joining in from 3pm while their courts are refurbished. Since the barbecue is the first joint session with Wilton it should be a lovely afternoon of tennis and the chance to meet some new players. Please do come along and join in regardless of your playing standard.